The Villa is located 50m from the pebble beach and the sea, surrounded by pine forest, which reaches, completely … More » to the sea. Private parking. 1km from Vrboska and 2km from Jelsa. 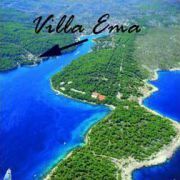 The villa is located in a quiet location, which consists of 15 houses. Anchorage for boat is provided. Small private camp with a capacity limited to 30 persons. It is located in a small bay without noise and traffic … More » . 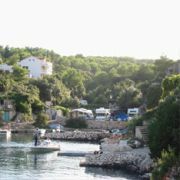 Ideal for families with children, guests with small motor boats, surfers, and anyone looking for peaceful holiday. Rocky beaches without sand, crystal clear sea for swimming.